Claudio LoCascio won't like it, but it's fair to describe him as a prince of the wine industry. His father, Leonardo LoCascio, founded and still runs Winebow, one of the leading U.S. importers of Italian wine and a player in wine from all over the world. Claudio, 23, is the youngest of Leonardo's four children. The older three were not interested in taking over the wine business, at least not yet (it's still possible as Leonardo was a vice president at Citibank before founding Winebow). Claudio wasn't either, at first. He majored in economics at Dartmouth and spent his internship working at a private equity fund. 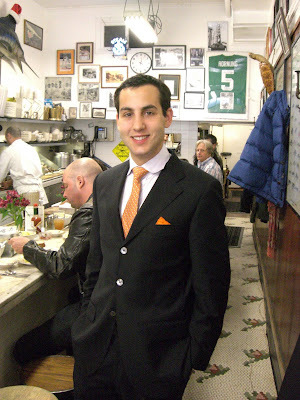 "I just hated it," Claudio said, over raw oysters at Swan Oyster Depot (his choice of restaurant). "You spend 9 to 9 at your desk, eat lunch at your desk. The priorities are all wrong." Claudio minored in Japanese, more out of travel-lust than ambition. "I wanted to study somewhere I hadn't been," he said, and if you look through Winebow's portfolio, that eliminates just about the entire wine-producing world. He ended up in Chiba, a city that neighbors Tokyo, and it's there that he discovered sake. I don't want to overstate the epiphany: It wasn't like True Sake's Beau Timken, who discovered sake in South Africa and really hasn't drunk anything else since. It was more like, this is better and a lot different than the sake I've had at sushi bars in the U.S.
"The most popular sakes in America tend to be good sushi sakes -- the fruitier, more floral daiginjos and ginjos," Claudio says. "I like a heartier, earthier sake. I like that kind of wine as well. What I like is to have sake with a meal. I cook at home, and I make hearty food. My mother is German, so that's her influence. I like sakes that have balance and have some character." Still, it wasn't Claudio's idea to start importing sake. It's not exactly a booming market in the U.S., not like wine. Personally I think premium sake is a great drink and superb value, but it's still generally found only in Japanese restaurants and supermarkets. Leonardo called Claudio and said he was going to vacation in Japan, and would Claudio like to meet him in Hokkaido, Japan's northernmost island? Since Hokkaido has perhaps the best seafood in the world (I still drool remembering the huge, sweet scallops), that was an easy yes. Leonardo told Claudio he was thinking of adding sake to Winebow's portfolio, and naturally he had a bigger gameplan in mind. "Just in New York, there's maybe 100 Japanese-owned restaurants, most of them high end," Claudio says. "They have very few Italian wines at all." The idea was, a sake portfolio would get Winebow in the door at Japanese and other Asian restaurants, where its salesman could then talk about improving the wine selection (which, in most cases, isn't hard to do). Italian whites in particular are excellent with raw fish, certainly better than the mass-produced Chardonnays offered by so many places that don't pay attention to their wine list. Soon after graduation, Claudio became the sake brand manager for Winebow. It's unusual, but not unique, for a wine company to import sake. Sausalito's Vine Connections has the bizarre combination of Argentine Malbecs and really outstanding sakes. But most sake in the U.S. is imported by specialists like World Sake Imports (the folks behind the annual Joy of Sake show), Wine of Japan, and others. Even more so than with wine, sake producers value long-term relationships, and many of the great ones were already taken. But Claudio did have the advantage of looking for a different taste profile than most importers. He also decided, initially at least, to narrow his geographic focus. Almost all of Winebow's sake producers are located in the rural northern prefecture of Akita, which is well-respected for producing hearty, complex sakes. The one exception, Ichishima Shuzo in Niigata, produces the most beginner-friendly sake in Winebow's portfolio, the light, slightly sweet Silk, a junmai that's reminiscent of a German Riesling. I wouldn't hesitate to pour this for anyone who hasn't tried sake before. I'll be honest -- most of the Akita prefecture portfolio was rough for my tastes. I confess that I tend to best like "wine-like" sakes, particularly ginjos with a fruity character. The one sake I really liked was Tenju Shuzo's Chokaisan Junmai Daiginjo, which was probably where Claudio's sake tastes and mine intersect: It's rich and full-flavored for a daiginjo, with flavors of ripe pear, herbal and licorice notes and a very long finish. Claudio says he hasn't had any trouble selling sake despite the fact that he doesn't look particularly Japanese. "I've done a lot of dinners," he said. "What the sake industry needs is a national brand. You have no idea how many tastings I've been to where people say, 'I've had this before,' but they didn't remember until they taste it." I'm rooting for Winebow to succeed in improving the market penetration of sake for a number of reasons. The sake industry in Japan is in crisis, as most young Japanese spurn it as a drink of their grandparents' generation in favor of beer and shochu. Sake brewing is such hard work that few people want to go into the profession. Yet quality is higher than it has ever been because of advances in technology. The U.S. market is vital for keeping small family-owned breweries alive. At the same time, the U.S. market needs to do a better job of presenting sake when it's fresh -- and not overcharging for it. Hopefully a company with Winebow's reach can help here as well. "It takes a month to get sake to New York from Japan," Claudio says. "We're working on direct containers to California." As for the prices, it's outrageous how much markup some restaurants (Napa Valley's Go Fish, for example) take on sake. They can't get away with charging 5 times retail on a bottle of wine because people have some idea of the price. But with sake, it's gouge away. "The vast majority of Japanese restaurants in America are not Japanese-owned," Claudio says. "They're owned by Chinese and Koreans and that turns it from a work of pride into a business. They know they can sell cheap sake at a big markup and no one will know about it." Yet the sake list isn't necessarily good at Japanese-owned restaurants either. In short, there are very few places where you can have a few different interesting glasses of sake. I'd like to name an exception here in San Francisco, but I cannot. "The Japanese restaurants want people to focus on the food," Claudio says. "They don't want the sake to overshadow the sushi." All of that said, Claudio says -- and if it's fresh, I agree -- "I would much rather spend $75 (retail) on a sake than on a wine. There's no money spent on marketing. It's all going into the bottle." Unfortunately, while great sake is a bargain, it's still not cheap. Claudio thinks the point of inflection, where you go from taking your chances to having great chances, is $25 to $30 retail. It's tough to get people to spend that when $12 wines are all the rage -- and $12 sakes, generally, aren't so great. But if you're willing to spend $25 a bottle, Claudio suggests that sake will go with way more foods than you might have imagined. "If you're having spaghetti with clam sauce, a honjozo would go well with it," he says. "If you're having pizza, I'd have fuutsu. It's hearty." Great article Blake-san. 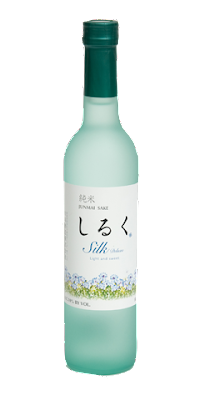 I just happened to try the Silk last week and loved it. Slightly sweet and perfect for a hot summer day as an aperitif. Great story about Claudio following his passion. Drinking Sake with Non-Asian meals has been one of my favorite discoveries. Thanks for covering this!! Nicely written, Blake. Sake evangelism takes time and we here at Vine Connections are only happy to have more well-run companies like Winebow getting into the business to move the process forward. Now, if they can figure out how to make sake move all the way from Japan to the US and into people's mouths in 6 months to a year, then I'll be really happy. We ship every few weeks in small quantities from our kuras in order to maintain freshness, but the US distribution chain is long and wide, and with many touches that must all rotate stock properly (including the retailers/restaurants who serve the customer). Keeping those dates current is a tough task. We stay at it, nonetheless.